Consider this business succession question. operate in depends on your company for its health and wealth. that the interests of your school and your community will not be well-served. Here’s the kicker: you’ve been dead for more than 70 years. Milton Hershey did indeed die in 1945, but his remarkable legacy lives on. Many family businesses have a difficult time surviving one generation to the next. The Milton Hershey story is one of a man who not only created a company that thrives financially more than 70 years after his death, but one that continues to reflect his unique humanitarian vision for the role of a business in the community and the world. Hershey was born in 1857 and raised in rural Pennsylvania. He had little formal education but a strong work ethic instilled from his Mennonite upbringing. His interest in candy began in his teen years when he took an apprenticeship under a Lancaster confectioner. Before he was 20 years old, he established his first company, the M.S. Hershey, Wholesale and Retail Confectioner Company in Philadelphia in 1876. Despite his enthusiasm, Hershey’s lack of business experience led his shop to bankruptcy after only six years. His second operation in New York was also unsuccessful, as were subsequent business ventures in Chicago and Denver. Hershey refused to give up. He returned to Lancaster broke, but undeterred. He opened yet another candy business, the Lancaster Caramel Company, using a new recipe he had learned in Denver, adding fresh milk to create a creamier product with longer shelf life. Finally, 10 years after opening his first business, Hershey began to experience commercial success with his “Crystal A” caramels. Within a few years, the Lancaster Caramel Company had more than 1,000 employees and was shipping caramels across the U.S. and even to Europe. Hershey attended the popular Chicago World’s Columbian Exposition in 1893. While most attendees were interested in the replicas of Christopher Columbus’ ships or the original Ferris wheel, a German chocolate-making machine was what captured Hershey’s attention. He was impressed with the efficiency of the machine, and it inspired him to make the biggest strategic business move of his life. He purchased two of the Lehmann machines, shipped them back to Lancaster, and created the Hershey Chocolate Company as a division of his caramel company. With the new equipment, he perfected a milk-chocolate recipe and introduced a variety of new chocolate treats. Pushing all his chips to the centre of the table, Hershey sold the Lancaster Caramel Company for $1 million. He was now all-in on chocolate. Even better, Hershey was on to something big. The chocolate business was soon booming. He began searching for a larger manufacturing facility. Hershey settled on a large tract of land in rural Pennsylvania near his hometown of Derry Church. The land was close to dairy farms that would soon provide the fresh milk required in his chocolate recipe. The location was also ideally situated near a quarry that could supply the building materials for the factory, homes and public buildings he envisioned. Hershey was building a town that would bear his name. By 1905, the factory was in production. It was now creating the first five-cent Hershey bars, with net sales exceeding $1 million in the first year alone. Soon after, the town was renamed in the chocolate industrialist’s honor, and, by 1906, Hershey, Pennsylvania was born. By this time, Hershey considered business ‘a matter of human service,’ and he was practicing what he preached. He had created a thriving chocolate industry prosperous enough to run his utopian town complete with gardens, churches, libraries and electric-powered homes. He and his wife, Catherine, lived comfortably but had little interest in spending their excess wealth. Unable to have children of their own, the couple opted to open a school for underprivileged boys in 1909. The Hershey Industrial School provided needy boys with security, stability and an education. The enrolled pupils lived on homestead farms in the countryside surrounding the town with “house parents,” and were given an education that covered academics as well as practical trade skills. Over time, the school broadened its range of subjects and accepted applications from underprivileged girls as well. When Hershey passed away in 1945, his company controlled 90% of the milk chocolate market in the United States. In the ensuing decades, the Hershey empire continued to expand far beyond Milton’s initial objectives. It purchased H.B. 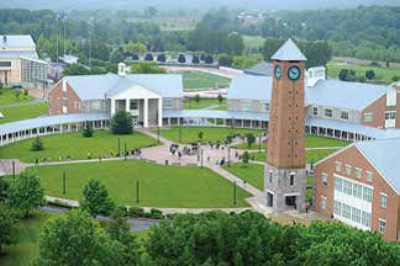 Reese Candy Company, expanded product offerings with Jolly Rancher candies and Ice Breaker mints, and gained the rights to produce Cadbury chocolate and Kit Kats in the U.S.
Today, Hershey remains the largest chocolate manufacturer in North America, and the Milton Hershey School – which provides free tuition, housing, food and clothing to 2,000 low income students each year – is one of the wealthiest in the world with more than $9 billion in assets. Hershey clearly left behind a rich legacy. His impact touches not only chocolate bars and candy, but an entire industry and his own philanthropy. It’s a legacy that has stood the test of time – and the desires of many business suitors. For example, the Trust considered selling its controlling interest in 2002 in order to diversify its holdings. The response from Hershey citizens was overwhelmingly negative. Many protested the potential sale until the Trust withdrew the offer. Those protests were undoubtedly in the minds of the Trust’s Board of Directors when Mondelez came calling in 2016. The initial offer of $107 per share was sweetened when Mondelez approached Hershey CEO J.P. Bilbrey with the promise of $115 per share weeks later. But Hershey stated that $125 per share was its starting point for negotiations, and that any further negotiations would have to wait until the Trust’s Board of Directors went through a refresh in the following year. Mondelez announced in a statement soon after that “there was no actionable path forward.” While many bystanders and financial analysts find the concerns over the Trust’s lack of diversification to be valid, the Trust continues to maintain its principled stance. Having faced and rejected two takeover events, both the citizens and Trustees have become more acutely aware of their responsibility to protect Hershey’s legacy. Finding a fine balance between financial and ideological goals is certainly challenging in the absence of a Hershey heir. Nevertheless, Hershey’s legacy – abundantly beneficent and clear – provides guiding principles for its future. Between the Trust and citizens, the fate of Hershey will remain guarded for the benefit of its industrious community and deserving pupils – just as Milton Hershey wanted it. What is your richly envisioned legacy? Have you taken steps to protect your life and business vision? Have you identified successors to ensure the future success of your business? Paul Russell is a freelance writer based in Toronto.